Huge congratulations to Northern Ballet Theatre's Artistic Director, David Nixon OBE. The New Year Honours list has been published today. 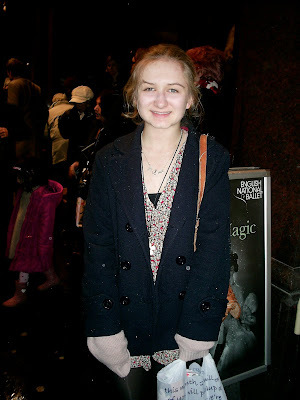 Our recent competition winner, Emma Stanworth, attended a performance of ENB's The Nutcracker. Emma said afterwards "it was beautiful, utterly amazing! My favourite part was the pas de deux between Clara and the Nutcracker. It was also really good to see the dancers who were nominated for the Emerging Dancer Award, they were all so good and I can't wait to hopefully see them in the future!" The dancers short-listed for the Emerging Dancer Award are : Esteban Berlanga, Anaïs Chalendard, Crystal Costa, Ksenia Ovsyanick, Junor de Oliveira Souza and Venus Villa. If you'd like to know more about the dancers short-listed for the Emerging Dancer Awards, I have published interviewes with some of them, including Venus Villa, Crystal Costa, Anaïs Chalendard and Esteban Berlanga. I will shortly be publishing interviews with the final two nominees. Happy New Year Elise! Hope you have a wonderful 2010! Hi Elise, I love your site and Happy New Year to you too! You cannot imagine how happy I was to have a dancer/lover of dance stop by my site and leave a comment. Thank you. I got behind on my blog this fall but will be blogging and reading blogs this year (a new year's resolution) and am adding you to my reading list. Galaxy6139 - thank you - you too ! Cloudia - wow ! sounds sooo exotic - thank you - lucky you with the weather ! daisychain - thank you - you too ! Jojo - welcome, and thank you ! Lovely to hear from you. Couture Cookie - thank you - same here ! Make Do Style - and to you - thank you ! Hello Elise darling, I do hope you had a wonderful time ringing in the New Year and that 2010 turns out to be the best year of your life, followed by many more. Thanks for all your visits and sweet comments; you are a dear friend...a treasure. Great posts :-) The Nutcracker I especially have always been a fan of. Happy New Year!